"We pride ourselves on the outstanding service that we provide and look forward to having you experience true Thai hospitality at its finest." 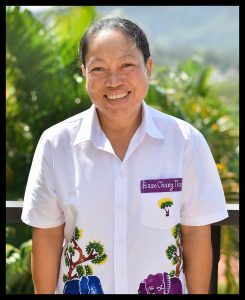 Gorn is the live-in villa manager and has been with Bann Chang Thai from the very beginning. 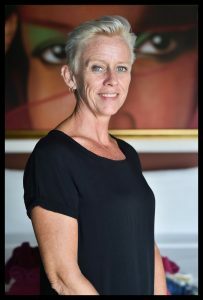 She's the head of staff, speaks very good English, and is responsible for the day-to-day operations of the villa. If you have any needs or requests, she's the best one to ask. "Gorn and her crew attend to everything you need. They are glad to arrange excursions, get special items from the market, wake you up when its time to go to the beach, whatever you ask." 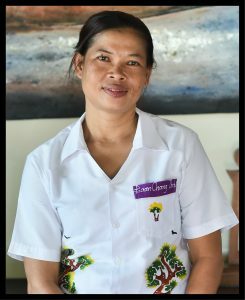 Noi is the head-chef for Bann Chang Thai and she has been with us for over six years now. She is quite versatile in the kitchen, but her specialty is authentic Thai cuisine. If you have any special dietary needs (or allergies) please be sure to let her know and we'll be happy to prepare your dishes accordingly. "My family is still singing the praises of the wonderful Chef Noi and the magical culinary storm that she whipped up for us every day of our stay." 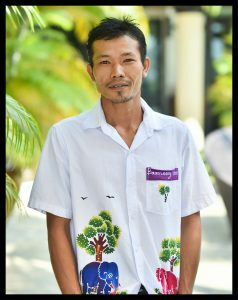 Nam is originally from the North Eastern part of Thailand but has lived in Phuket for many years now. 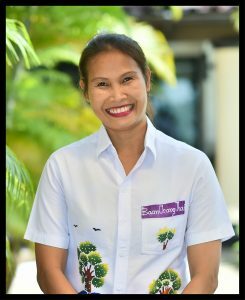 She has been working at Bann Chang Thai for around six and a half years and is an integral part of the Bann Chang Family. She usually works evenings and is one of the staff members helping serve dinner. Her English is quite good and she is fantastic with kids which is great as she can also babysit if the adults feel like going out for the evening. "Khun Nam even travelled to the hospital with my mother to make sure she was ok in the middle of the night. The rest of the girls made our stay both warm, homely and comfortable. They always had a smile and nothing was too much trouble." Rat is the driver for the villa and has worked with us for three years. Before working in the villa, Rat was a driver as well. 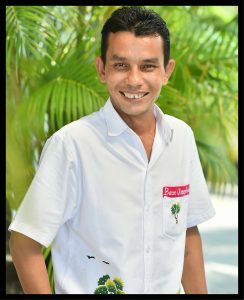 His driving skills, experience, and knowledge of Phuket will get you to any destination on the island safely, comfortably, and on time. So relax and let Rat do the driving for you. "With people coming and going — from young children to my elderly parents — there were lots of pick ups and drop offs to the airport, and lots of day trips that people wanted to go on. Nothing was to much trouble for the staff, and they were always there with a smile and helping hand." Lai has been working at the villa for about five years now. She is one of our maids, so feel free to say hi. She doesn't speak much English but she is more than happy to help and is always smiling. 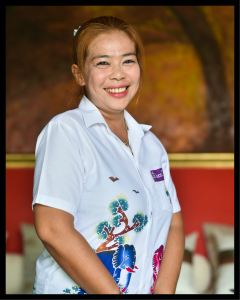 Lai takes pride in her work and keeps the villa rooms in immaculate condition. "I am a clean freak and I was very comfortable here. The level of daily cleaning here is equal to or better than any hotel I've ever stayed in including the One and Only, Four Seasons, and the original Peninsula. Don't get me wrong, those are all stellar, this is certainly on par." Nine is the villa host. He has been an integral part of our staff for three years. 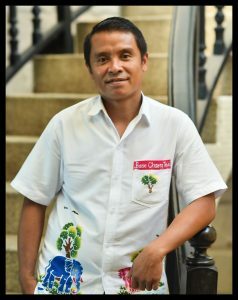 Before working in the villa, he worked in a restaurant. His experience in the service and hospitality industry has been a great asset to our team. Nine lives by the adage that: people forget what you've said and what you've done, but they never forget how you made them feel. 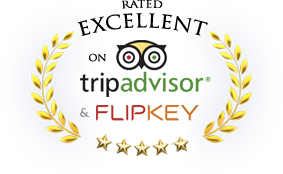 "The service was more then perfect, all the staff is very nice, friendly and always there to help you with anything." 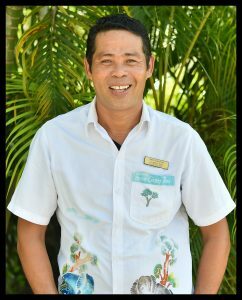 Minh is the maintenance manager for both of our villas and has been on the team for nine years. He was also in charge of the construction team that renovated Baan Sung Thai and knows both villas inside and out. 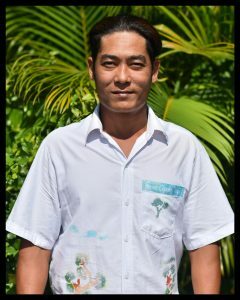 Minh has great English skills which enables him to communicate with guests and staff alike. "The villa is just as amazing as it looks in the pictures. It is kept in immaculate condition and has a full staff to help you with anything you need." Bae is one of the repair men at the villa as well as one of the hosts. Bae has been working with us for five years. Before working in the villa, Bae worked as a construction worker. He is very handy with tools and will do his best to quickly mend anything that needs fixing. Bae works at both of our villas. "We have travelled to various places in Asia over the last 6 years, both in hotels and villas. Never before have we stayed in such a fantastic place. The décor is just gorgeous, so tasteful and thoughtful. All the rooms are spacious and very comfortable. The service is out of this world and is how every villa should be run." Soda is another handyman at the villa as well as one of the hosts. Soda has been with Bann Chang Thai for one year. Before working at the villa, he was also a construction worker. Soda's proven to be a great addition to our stellar team. Soda works at both of our villas. "Bann Chang Thai exceeded all our expectations, mainly according to the service-oriented, warm-hearted and considerate staff. Their concern for all of us and especially for the children was fantastic and invaluable." Maria is the villa's event and wedding coordinator. She's worked in the villa for two years. Before working in the villa, she owned a Swedish/American school. Maria is focused and well organized; if you are planning any special event, she's the one that will ensure that it is tailored to your liking. Maria works at both of our villas. "The owner promptly put me in touch with the villa's wedding planner, Maria, shortly after booking. I have to say I was very apprehensive as, at the time, Maria was new to the villa; I bombarded her with questions right up to the day of my wedding through emails. She was FANTASTIC!!! All my wedding party commented on how amazing she was; she ensured I had everything I'd asked for, and took so much stress off our special day." © 2018 phuketparadisevillas.com All rights reserved.